Anushka Sharma And Virat Kohli Snapped Cuddling In Their Resort’s Balcony! Home BOLLYWOOD Anushka Sharma And Virat Kohli Snapped Cuddling In Their Resort’s Balcony! Anushka Sharma and Virat Kohli look utterly adorable cuddling in their resort’s balcony! 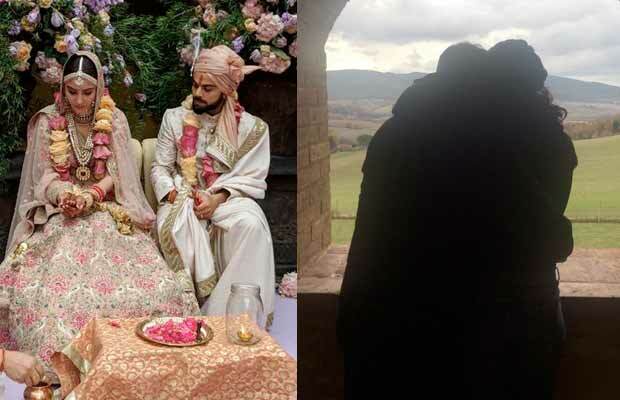 Bollywood actress Anushka Sharma and Indian Batsman Virat Kohli entered holy matrimony in a hush-hush ceremony in Tuscany. No one got the wind of their upcoming nuptials. It was only when Anushka and her family were spotted at the airport with their family priest, rumours started circulating. Their families and close friends attended their wedding celebrations at the heritage resort Borgo Finocchieto. The pictures from Tuscany look like they’re straight from a fairytale book! Anushka and Virat look like royalty in their bespoke Sabyasachi Mukherjee ensembles! For their ring ceremony, Anushka wore a bespoke red velvet saree while her hubby-to-be wore a sharp three-piece blue suit. For their mehendi ceremony, Anushka sported a vibrant yellow and hot pink lehenga teamed up with a floral choli. Whereas, Virat wore white kurta pyjamas teamed with a red half bandgala jacket. As for their wedding ceremony, Anushka wore a light pink lehenga with intricate embroidery and Virat wore an ivory raw silk sherwani. The couple looked so much in love and seemingly they cannot keep their hands off each other! In the recent pictures that have surfaced, we can see Anushka and Virat wrapped in each other’s embrace on their resort’s balcony! Only the couple’s silhouette is visible in the pictures and not their faces. Anushka and Virat are facing the balcony that overlooks the lush green rolling hills. The couple is bundled up in dark thick winter jackets and beanies. Currently, the couple is still basking in matrimonial bliss in Tuscany where they pledged their undying love to each other. Post their return to India they will host a reception in Delhi for their relatives on December 21st. On December 26th, Anushka Sharma and Virat Kohli will host a reception party for their friends from the industry. Next articleBigg Boss 11: Priyank Sharma And Hina Khan Provoke Vikas Gupta- Watch Video!